In general comparing a PS2 title to a PS3 title is a bit like comparing apples to oranges. That being said, it’s still quite amazing to see what the team at Sony Santa Monica Studios have done with the power of the PlayStation 3. 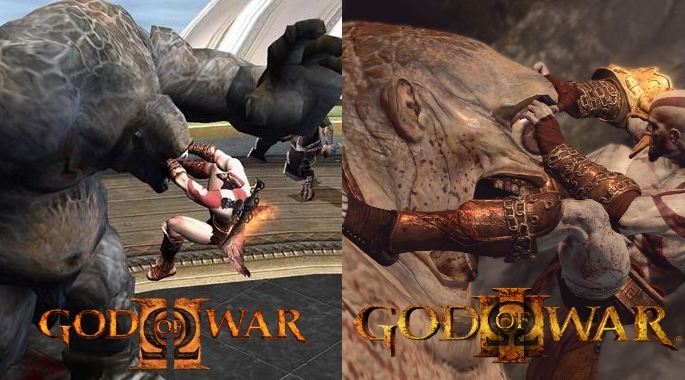 Kratos on the PlayStation 2 was a quite a feat for the God of War developers at the time, with the “Ghost of Sparta” pushing a polygon count of roughly 5,000 polygons. Kratos on the PlayStation 3, however, quadruples that amount for as many as 20,000 polygons. While that is not quite as much as the reigning graphics king on the PS3, Nathan Drake, it’s more than double that of Old Snake. Then again Drake wasn’t battling a 1600 foot tall Cronos, which surely eats up a god’s share of polygons. 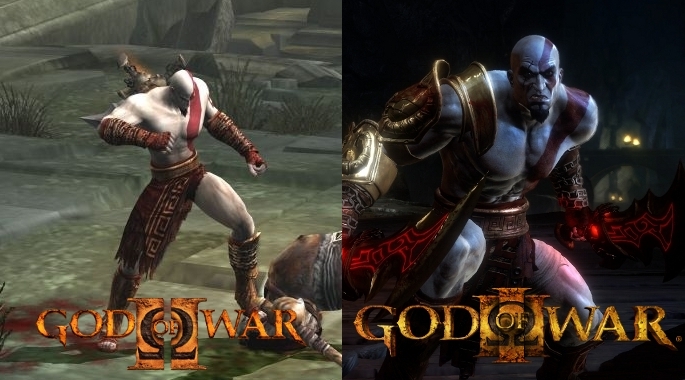 The first God of War was limited to 15-20 generic looking characters on screen at once. Due to the Cell’s unique architecture, Kratos can battle over 50 distinct enemies on screen at once. Enemy AI has also been improved dramatically, allowing enemies to team up to attack Kratos, or even protect one another. 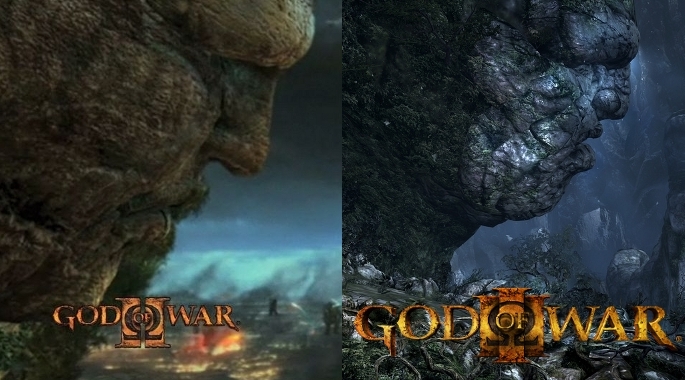 Now that you’ve seen gameplay shots of God of War II vs. God of War III, the following images showcase God of War II’s pre-rendered cut-scenes vs. gameplay God of War III shots. 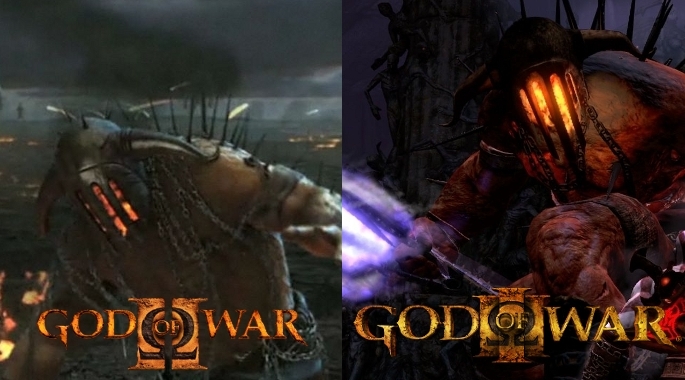 The God of War III in-game screens look much, much better than God of War II’s pre-rendered cut-scenes. Quite an accomplishment, especially since pre-rendered cut-scenes generally have better visuals than in-game cut-scenes, mainly due to pre-rendered scenes being produced on more powerful hardware. Whereas in-game cut-scene is dependent completely on the game engine. Just goes to show what a difference three years can make with a quantum leap of hardware. This past week, new footage of God of War III was revealed on GameTrailers TV. To see all the new footage of the upcoming blockbuster PS3 exclusive, click here. For some brutal HD screenshots grabbed straight from the footage, click here. God of War III brings chaos to the PlayStation 3 on March 16 in North America, while Europe will have to wait 3 more days until March 19, to finally get their hands on Kratos latest adventure.